One goal of the Highways for LIFE initiative is to move innovations into standard practice. Now, that’s happening in Vermont, thanks in part to a 2009 Highways for LIFE demonstration project. In March, the Vermont Agency of Transportation made stainless steel reinforcing standard for bridge superstructures on high-traffic pavements, replacing epoxy-coated steel. In the demonstration project, the agency replaced a $2.84 million bridge that carries U.S. Highway 2 over the Winooski River in East Montpelier. It was designed as a very-low-maintenance bridge. The superstructure has five weathering steel girders (no paint), with a bare concrete deck of high-performance concrete (no membrane or overlay) and stainless steel rebar. Vermont now specifies three levels of superstructure reinforcing for bridges. For Levels 1 and 2, which include nonpaved roads or roads not on the National Highway System, epoxy-coated reinforcing steel is permitted. Level 3, where stainless steel reinforcement is required, includes all new interstate structures, all new National Highway System bridges and other structures for which the agency determines that future road user costs for doing a project are high. 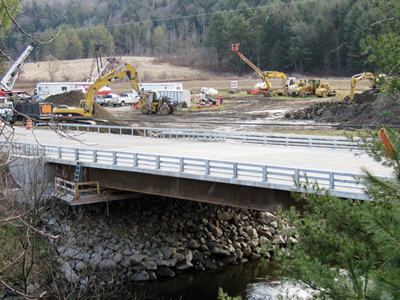 “Following the design of the 2009 bridge, the Vermont Agency of Transportation realized that stainless steel would give them a corrosion-resistant rebar,” said Mark Richter, construction maintenance engineer for the Federal Highway Administration Vermont Division. Corrosion problems can occur when waterborne chloride ions, brought on by the use of road salt in the winter, leach into the concrete and reach the reinforcing steel. Because Vermont has a freeze-thaw environment in the winter, the use of road salt is extensive. 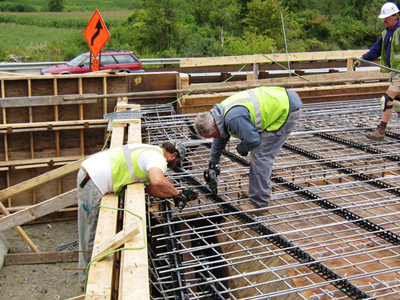 Crews used stainless steel rebar to reinforce a bridge superstructure on a Highways for LIFE project in Vermont. Stainless steel is an innovation because the traditional method of protecting steel from chloride corrosion is to coat the rebars with epoxy. Epoxy coatings can have holidays, or tiny holes in the coating, that permit chloride ions to penetrate to the steel and cause corrosion. The corrosion can expand and cause the concrete to pop out in that area, making concrete repair necessary. That usually involves chipping hammers, which can further damage the epoxy on the rebars. Stainless steel rebars do cost more initially, but the Vermont agency determined it to be worth the money over the life of the bridge. “On an average project, we anticipate that stainless over epoxy will raise the per-pound cost of the steel by approximately a factor of three,” said Symonds. On average, the state estimates that stainless increases the cost of a bridge deck by $27 per square foot. For an average project, though, the cost only goes up by 3.7 percent. Vermont has made stainless steel reinforcing standard for high-traffic bridges. “For the same average project, we anticipate a $975,000 saving on maintenance and rehabilitation costs over the life of the project, compared to the $94,500 initial increase in cost for stainless steel,” Symonds said. The Vermont agency is planning two bridges that will use stainless steel rebars in the superstructure, one this summer in Windsor and another in Milton in 2013. Both bridges, located on interstate highways, will be built using the design-build contracting method. To read about the Vermont Highways for LIFE demonstration project, see www.fhwa.dot.gov/innovation/innovator/issue15/issue15.pdf. A pavement marking system designed to make it easier for drivers to navigate work zones when it's dark and rainy got its first real-world test on construction projects under the Federal Highway Administration's Technology Partnerships Program. Traditional pavement markings can be hard to see in inclement weather, making it tricky for drivers to find their way through unfamiliar work zones. The idea behind the 3M™ All-Weather Paint for work zones, developed by 3M of St. Paul, Minn., is to make driving lanes more visible, enhancing safety for both motorists and construction workers. 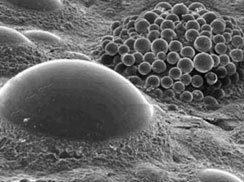 The all-weather paint system combines typical glass beads with optical elements made of a ceramic core surrounded by high-refractive-index beads that provide retroreflectivity under wet conditions. The company used a grant from the Technology Partnerships Program to refine the pavement marking system and evaluate it in cooperation with highway agencies. The program, part of FHWA's Highways for LIFE initiative to accelerate use of highway innovations, offers competitive grants to industry to develop prototype technologies with potential to improve highway safety or quality or reduce congestion. The all-weather pavement marking system combines high-build waterborne paint and glass beads that provide good visibility in dry conditions with optical elements made of a ceramic core surrounded by high-refractive-index beads that provide retroreflectivity when it's wet. The goal of the Technology Partnerships project was to develop the system for cost-effective temporary use in work zones. “Funding from the Technology Partnerships Program allowed us to optimize performance of our durable pavement marking product to improve safety in construction work zones,” said Mark Zender of 3M's Traffic Safety Systems Division. To test the prototype all-weather system for work zones, 3M used a two-phase process, starting with a human factors study at the Texas Transportation Institute. Researchers applied three versions of the prototype, along with two conventional pavement markings, to a closed course that includes a section where artificial rain can be generated. Thirty participants evaluated the pavement markings by driving the course at night under dry, rainy and wet conditions. After analyzing the findings, researchers determined that all three prototypes performed equivalently under all conditions and significantly outperformed the conventional markings under wet and rainy conditions. The tests also helped 3M choose one mix method for the all-weather paint to try under real-world conditions. In phase two of the project, the all-weather marking system was evaluated in actual highway work zones. Researchers at North Carolina State University and Ohio University worked with highway agencies to choose three sites in North Carolina and two in Ohio. At all five locations, both standard paint and the all-weather version were applied so they could be compared. One measure researchers analyzed was retroreflectivity, or the ability to reflect light back to the source. They found that the all-weather pavement markings were significantly more reflective than standard paint when correctly installed. But they also found variations in their retroreflectivity readings, suggesting that contractors' paint application methods may not have been consistent. Researchers also measured the rate of lane encroachments, or vehicles that cross the center line of a road, and lateral lane placement, or the position of the vehicle in the driving lane. Their hypothesis was that the brighter lane markings produced by the all-weather system would make it easier for drivers to make safer driving maneuvers. In both cases, the results were mixed. At one work zone, for example, researchers found that a significantly higher number of lane encroachments occurred at curves with standard paint, while at another the difference in lane encroachment rates was statistically insignificant. 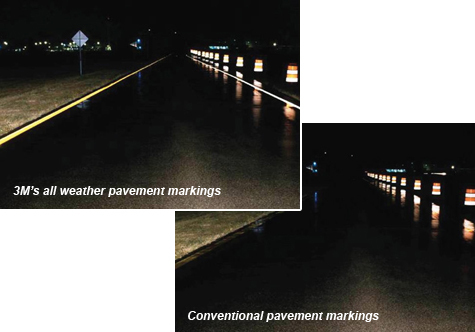 Tests showed that 3M's all-weather pavement markings are more visible to drivers in dark, rainy conditions than conventional pavement markings. When researchers analyzed lateral lane placement in the work zones, they again saw variations in the results. More often than not, though, motorists maintained safer lane placements when traveling in lanes marked with the all-weather paint, indicating a lower potential for sideswipe crashes or collisions with pedestrians or fixed objects. The work zone tests demonstrated the challenges of conducting field evaluations, Zender said, including dealing with work zones with various entrance and exit geometries and ambient lighting conditions, different types of vehicles and headlights, and drivers of all ages with varying degrees of attentiveness. Researchers also needed rain that was consistent throughout the work zone and that lasted long enough for them to collect good data. “Of all the challenges we faced, the most difficult was dealing with the uncontrolled variables that a real-world evaluation presents,” Zender said. For Information on Technology Partnerships, visit www.fhwa.dot.gov/hfl/partnerships, or contact Julie Zirlin at (202) 366-9105 or Julie.Zirlin@dot.gov. For details on 3M All-Weather Paint, contact Mark Zender at (651) 736-4594 or mdzender@mmm.com. To view an FHWA report on the project, All-Weather Paint for Work Zones Field Evaluation in North Carolina and Ohio, go to www.fhwa.dot.gov/hfl/partnerships/safetytech.cfm. 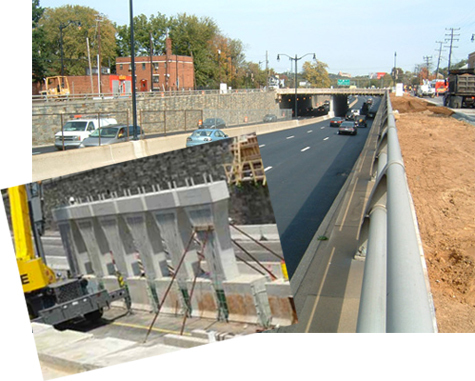 The District Department of Transportation cut construction time in half and saved $660.4 million when it used an innovative traffic plan and accelerated construction methods to rebuild a bridge over a major expressway in Washington, D.C. The innovative approaches used on the $10.4 million bridge project added about $3.2 million in construction costs and $4.3 million in vehicle operating costs because of detours, according to a Federal Highway Administration report on the project, Reconstruction of Eastern Avenue Bridge Over Kenilworth Avenue in Washington, D.C. But an economic analysis found that finishing the project in one construction season instead of the two required for conventional construction produced huge savings on delay costs of $667.9 million, the report noted. The District DOT received a Highways for LIFE grant from FHWA to use innovations on the reconstruction project, which was needed to increase the vertical clearance under the bridge from 14 to 16 feet (4.2 to 4.8 meters). Because of its low clearance, the bridge had been hit by trucks multiple times, causing extensive traffic jams in the area. The project met Highways for LIFE goals for safety, construction congestion and quality. In the future, the number of clearance-related crashes and traffic jams is expected to decrease and the superstructure is expected to improve safety for both pedestrians and vehicles. The new, taller bridge is expected to reduce clearance-related crashes and be safer for drivers and pedestrians. (Inset) Using prefabricated pier units helped the District DOT finish the project faster. Diverting some traffic onto service roads not only reduced construction congestion, it also minimized traffic queuing and back-of-queue crashes. Additional safety measures during construction included use of median barriers to separate workers from traffic and closing of the roadway in both directions during nighttime installation of the prefabricated superstructure. As a result, no worker injuries were reported and none of the traffic incidents that occurred were attributed to construction activity. The project met the Highways for LIFE goal of a 50 percent reduction in the time highway users are affected by construction. A traffic study showed that on average, peak trip time dropped by 13 percent compared to the average preconstruction speed, meeting the goal of less than a 10 percent increase in trip time. The traffic queue lengths during construction were minimal, much shorter than the goal of less than 1.5 miles (2.4 kilometers) in an urban setting. The use of prefabricated elements cast under controlled conditions is expected to extend the service life of the new bridge. Also contributing to durability is the use of low-permeability concrete and a waterproof membrane with an asphalt overlay over the prefabricated deck, which will reduce moisture penetration. Among the lessons the District DOT learned from the project was that rerouting traffic to parallel roads near the work area resulted in less congestion and queuing than the more traditional approach of closing lanes in the work area. The highway agency demonstrated that it could use prefabrication and accelerated construction techniques successfully to build a project faster and minimize disruption to the traveling public. Also, use of a no-excuse contract clause that disallowed time extension because of inclement weather helped the agency get the job done despite loss of time because of major snow in the area. “DDOT gained considerable experience with the innovations used on this project and because of the success is encouraged to include these innovations in future projects, especially those that need to be completed in far less time than with traditional methods,” the report said. To read the Washington, D.C., and other technical reports on Highways for LIFE demonstration projects, go to www.fhwa.dot.gov/hfl/projects. Timely preservation of sound bridges can extend their useful life and cost less than reconstructing or replacing them, participants in a Federal Highway Administration Web conference on bridge preservation practices learned. As resources become scarcer for bridge rehabilitation and replacement, preservation is taking on more emphasis to extend the service life of bridges, said Myint Lwin, director of FHWA's Office of Bridge Technology, who moderated the Web conference. The event, part of the free “Innovation” series sponsored by Highways for LIFE and the National Highway Institute, was based on Bridge Preservation Guide: Maintaining a State of Good Repair Using Cost-Effective Investment Strategies, an FHWA report available at www.fhwa.dot.gov/bridge/preservation/guide/guide.pdf. Bridge preservation includes any activities and strategies that prevent or delay deterioration of bridges, restore the function of bridges, or keep bridges in good condition so they'll last longer, explained Anwar Ahmad, FHWA bridge preservation engineer. “Bridge preservation can include both preventive maintenance and rehabilitation,” he said. Some preventive maintenance activities are based on bridge condition and are done when needed, such as sealing or replacing leaking deck joints, installing deck overlays and painting steel elements, Ahmad said. Cyclical activities, done at predetermined intervals, don't necessarily improve bridge condition, but can delay deterioration and extend the time until the bridge needs to be replaced. Systematic preventive maintenance covers activities such as washing bridges every year or two, sealing concrete bridge decks with waterproofing sealer every three to five years and spot or zone coating steel beams every 10 to 15 years. The key is to start preventive maintenance when bridge components and elements are still in good condition and make it a regular activity. “You've got to stick with it,” he said. Set goals and performance measures, considering the condition of the bridge inventory, available resources and stakeholder input. “The goals will serve as a compass for the journey ahead and the measures will serve as a mirror that reflects actual performance,” he said. Identify systematic preventive maintenance activities and establish condition thresholds for applicable activities to help achieve the goals set. “Generally, you want to focus on bridges in fair to good condition,” he said. Determine the cost of the preventive maintenance activities and funding levels available. Select and rank projects, using factors such as traffic volumes, condition, age and safety. Develop a delivery plan that accommodates the funding and resources available, environmental restrictions, and work zone and traffic restrictions. Dr. George Hearn, associate professor at the University of Colorado at Boulder, discussed bridge preservation performance measures developed by FHWA's Bridge Preservation Expert Task Group. The group queried state departments of transportation about their performance measures that apply to bridge preservation and looked at published reports on the topic. The group found that performance measures for bridges fall into four categories: bridge condition, such as good or poor; bridge status, such as load restrictions or structural deficiencies; bridge programs, such as expenditures on bridge programs, and maintenance operations, such as level of service grades. 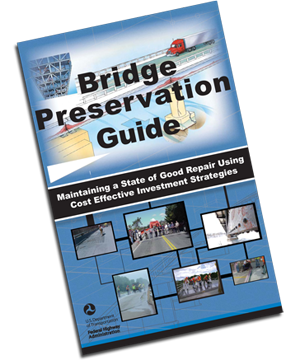 In developing proposed performance measures that could be applied to bridge preservation, the group focused on the population of preservable structures; network-level measures of preservation needs, plan and benefits; and use of existing condition data, deterioration intervals and average costs. The next step is to deploy the performance measures in a pilot study. “We'd like to work with state DOTs to get their data, produce performance measures and get DOT staff feedback on whether they're useful and what advice they would give to improve them,” he said. Based on that experience, the group can revise the proposed measures. The new “Driving Innovation” video tells the story of Highways for LIFE, the Federal Highway Administration initiative to accelerate innovation deployment to build roads faster, better, more safely and at less cost. To view it, go to www.fhwa.dot.gov/hfl or scan the QR code with your mobile device. Adam Matteo, assistant state structures and bridge engineer for the Virginia Department of Transportation, provided an overview of the agency's bridge preservation program. The agency's challenges include an inventory of aging bridges, 60 percent of which are at least 40 years old, the need to keep bridges designed for 50 years of service functional for 100 years or more, and a maintenance budget that covers about two-thirds of the need. Virginia's approach, Matteo said, is to spend resources wisely to extend the life of the bridge inventory. That includes replacing bridge joints in a timely manner, spending money on the most cost-effective actions, making sure all work is high quality, and concentrating on highway systems with the largest impact on customers and commerce. The state is also moving away from the worst-first approach of focusing on bridges in the poorest condition. Instead, it emphasizes preventive maintenance and balanced spending. “We have a lot of structures in good condition and we need to think about keeping them that way,” said Matteo. The agency has codified its bridge maintenance best practices in chapter 32 of its Manual of Structure and Bridge Division, available at www.extranet.vdot.state.va.us/locdes/electronic%20pubs/Bridge%20Manuals/VolumeV-Part2/Chapter32.pdf. To view the Bridge Preservation Webinar and register for future “Innovation” sessions, go to www.fhwa.dot.gov/hfl/resources/#webinar. 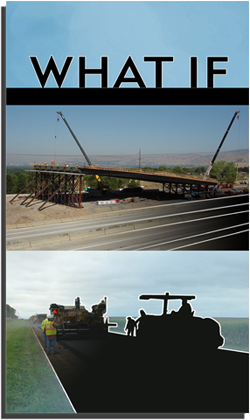 To access FHWA's bridge preservation toolbox, visit www.fhwa.dot.gov/bridge/preservation. The Maryland State Highway Administration will use self-propelled modular transporters to remove and replace two four-lane bridge superstructures over two successive weekends this fall in Anne Arundel County. Depending on the method selected, it would take up to two years to build the bridges in place using conventional construction. The agency received a grant from the Highways for LIFE program to use innovation on the project. SPMTs are long and narrow multi-axle vehicles that can lift a bridge superstructure, carry it a short distance, and maneuver it into place on either new or existing abutments. They've been used on several bridge projects in the Salt Lake City area in Utah and a in few other states, but never before in Maryland. In Maryland, the SPMTs will remove the existing bridge superstructures from their old abutments and carry the new superstructures into place on the old abutments. This is one of the first times SPMTs will be used to place a bridge on an existing abutment, said Ian Cavanaugh, area engineer for the Federal Highway Administration. The old bridges, both structurally deficient, carry West Nursery Road over Maryland 295, a divided commuter highway that links Baltimore with Washington, D.C., in a congested urban area. Both bridges carry more than 17,000 vehicles per day. G.A. & F.C. Wagman Construction won a $4.6 million contract to remove the old 76-foot-long (23-meter-long) simple spans and replace them with new superstructures. The new bridges will consist of steel beams supporting a concrete deck. A Maryland Highways for LIFE project features the use of self-propelled modular transporters to quickly replace two bridge superstructures over a busy commuter highway. On a Friday night this fall, the contractor will close one side of Maryland 295 and West Nursery Road. Using hydraulic jacks, SPMTs will pick up one of the old bridges from its abutments and move it to the median for demolition at a later date. On Saturday night, SPMTs will move the new superstructure into place and lower it onto the existing abutments. On Sunday morning, after a closure of just 34 hours, West Nursery Road will open for traffic. The next weekend, the same 34-hour process will be repeated to replace the bridge superstructure on the other side of Maryland 295. Before the bridges can be removed, some temporary lane closures will be needed to prepare the existing abutments to receive the new bridges. Robert explained that the new bridges are somewhat wider than the old ones, so that means removing ornamental pilasters, or columns, from each side of the old bridges. Moreover, back walls have to be removed from the existing bridges so that the new bridges can be moved into place. Steel plates will bridge the gaps at the abutments during construction. 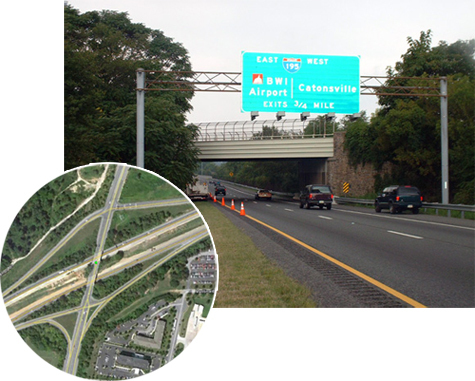 Because the new superstructures will be built in the median, workers will not be working over traffic on Maryland 295. That will improve worker safety, compared to building the bridges in place. And because lane closures will be dramatically reduced, work zone safety will be improved for both workers and travelers. To learn more about SPMTs, go to www.fhwa.dot.gov/bridge/abc/spmts.cfm.